Rhubarb is a lovely vegetable - yes rhubarb is a vegetable, not a fruit though it is often referred to as one. The delicate, slender stems of early rhubarb are known as Forced Rhubarb, and the arrival in the shops is always causing for celebration and time to get the rhubarb recipes out. Forced rhubarb heralds the waning of the cold winter months and the promise of spring just around the corner. How cheering the vibrant pink colour of rhubarb is on a grey day and how delicious too. Forced rhubarb is only around until March at the latest, then just for a brief spell it disappears, and there is about a month to six weeks before outdoor rhubarb is available. Whether buying the beautiful early rhubarb, or the later outdoor varieties, there are a few things to look out for to make sure what you are buying is the best. Rhubarb (genus Rheum) belongs to the plant family Polygonaceae. Contrary to popular belief, Rhubarb is a vegetable, not a fruit, being a close relative of garden Sorrel. The stalks of rhubarb though tart are edible, the leaves are toxic and never should be eaten. Rhubarb is 95% water. It contains no fat, sodium or cholesterol. Rhubarb contains a fair source of potassium. The crisp, sour stalks are rich in vitamin C, dietary fibre and calcium. The calcium in rhubarb combines with oxalic acid making it hard for the body to absorb. The telling sign of fresh rhubarb is not only its bright colour; the rhubarb stalks should be firm and upright, the leaves a pale yellow and never black. As with all local, seasonal foods, rhubarb is best eaten fresh. Also, avoid storing rhubarb for too long. If it's not possible to eat the rhubarb straight away, only top and tail the stalks, cut the rhubarb stalks into small pieces and poach gently, three or four minutes, in a little sugared water. Cool and freeze. This simple rhubarb compote can be used in pies and crumbles, folded into a custard and whipped cream or in many other recipes. Early spring rhubarb doesn't need peeling, only trim and wash. Outdoor rhubarb should only need a wipe for cleaning, however, if it is old or thick, it may need peeling by simply stripping back the outer layer. In sweet dishes, early rhubarb will not need much sugar to sweeten. However, outdoor can be very tart and will need more. Replace sugar with honey works well too. Some of the best recipes for rhubarb are "nursery-food" rhubarb pies, puddings, crumbles, and of course, with custard. However, in recent years rhubarb has enjoyed a lofty status appearing on menus at top restaurants alongside game, lamb, beef and fish. The sharp, acidic nature of rhubarb makes it a wonderful accompaniment to oily meats and fish. 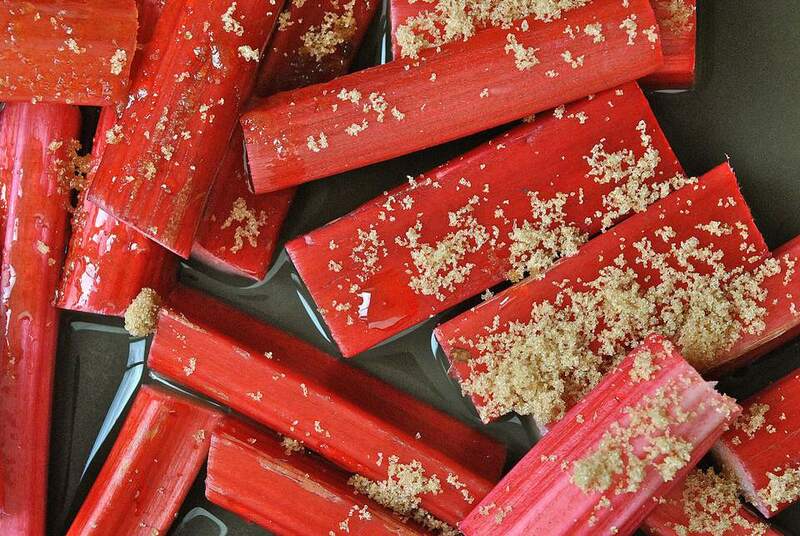 Here are 10 of the best sweet and savoury recipes for rhubarb. Enjoy.